How much does a country house cost to run? ‘Interestingly,’ adds Mr Beor-Roberts, ‘people who have sold their London house well are often less concerned with the capital outlay involved in buying a country house than with the level of income required to maintain it. In the latter half of 2013, for example, we sold 28 houses in the region for more than £2 million- four of them for more than £5m. And, generally speaking, most families would prefer to buy a six-bedroom main house, with a guest cottage that can be heated a few days before guests arrive, rather than an eight-bedroom house that needs to be heated all the time.’ A typical example of the kind of Cotswold property sought by today’s London buyer is Stone House at Wyck Rissington, three miles from Stow-on-the-Wold, Gloucestershire. This charming edge-of-village house with four bedrooms, a cottage, outbuildings, a swimming pool, a tennis court and 3.4 acres of glorious gardens, sold through Knight Frank last July for more than its £2.75m guide price, having attracted huge interest and more than 20 viewings. With the spectre of some form of post-election ‘mansion tax’ looming ever larger in buyers’ minds as 2015 approaches, country houses valued below the £2m threshold will remain the most sought-after this year. A Georgian old rectory is still most country people’s dream and one as authentic as the handsome Old Rectory at Wingfield, near Bradford on Avon, Wiltshire, which is cost-effective, easily run and priced at £1.85m-through Knight Frank in Bath (01225 325999)-appears to tick all the boxes. Built of Bath stone under a distinctive slate-and-stone mansard roof, the handsome Georgian building, listed Grade II, was originally owned by Keynsham Abbey until the Dissolution in 1539, and eventually bought ‘in a ruinous condition’ by Edward Spencer, the rector of Wingfield, in the late 1700s. According to parish records, Spencer rebuilt the house ‘at considerable expense in a plain substantial manner for his own residence’ and his smart new rectory, which sits near the church of St Mary, was soon the focal point of life in the village. It still is, for, even after its sale by the Church in 1974, successive owners of the former rectory have remained much involved in village life. The present owners, who, according to selling agent Charlie Taylor, love living in Wingfield and plan to remain there after the sale, have made substantial improvements to the house and grounds, including the construction of an oak-framed barn with garaging and stabling-the latter mainly used as a winter refuge for working donkeys from Weston-super-Mare. 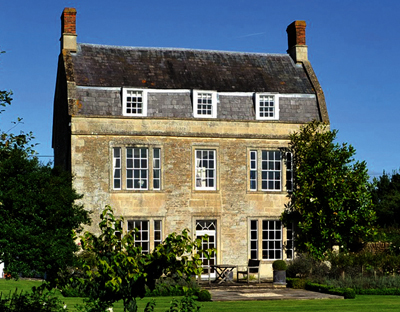 The Old Rectory is being sold with more than six acres of low-maintenance gardens and pasture and far-reaching views across open countryside to the famous White Horse at Westbury. The 82 acres of organic farmland around the house are also owned by the vendors and can be bought, as a whole or in part, by separate negotiation. The house itself is spacious and well-proportioned, with three main reception rooms, a country kitchen and an orangery/breakfast room on the ground floor. The first floor houses the master suite, three bedrooms, a bathroom and a study; the second floor, which can be closed off if not in use, provides a guest bedroom with an en-suite bathroom, two further bedrooms and a family bathroom. The coastal plain around the ancient Cinque Port of Rye, East Sussex, is alive with the sound of TV and film scores composed by musician extraordinaire David Hewson at his recording studio at Watlands, his country house overlooking the sea, 1-and-a-half miles from Rye, which has been his home for the past 14 years. During their tenure, he and his co-owner, Mark Josling, have poured considerable resources into upgrading the house, which dates from 1683, adding the studio and laying out their four acres of elegant but manageable gardens, which include an Elizabethan-style herb garden, topiary, lawns and 1,000 box plants, carefully planted one by one. They have also installed several wood-burning stoves: they burn about £650 worth of logs a year, but save on the oil-fired central heating, which is rarely used. The luxuriously appointed, 6,630sq ft house-which boasts reception and inner halls, three main reception rooms, an orangery, two studies, two kitchens, eight bedrooms, four bathrooms (including three spas), a gym and the 1,300sq ft music suite-is for sale through the Tenterden office of Chesterton Humberts (01580 765858) at a guide price of £2.55m.